The following patterns are available for purchase. you can use Visa, Mastercard or American Express. Patterns are offered at wholesale pricing in quantity orders for retail stores and teachers; please email for details. Patterns are mailed daily from Nova Scotia, Canada. Please allow 5-10 days for delivery within North America. International orders may be charged additional postage. Imagine a bright,sunny day on the water, as you sail off into the blue. 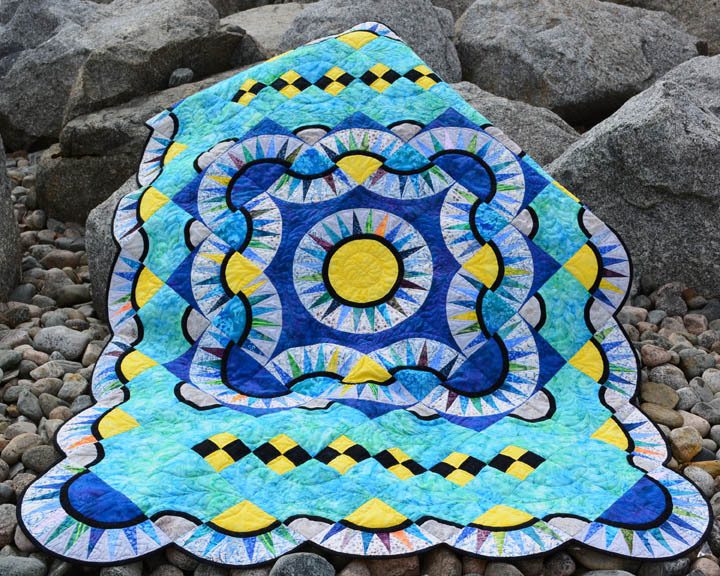 This simple to sew one-patch design is a scrappy mix of light, medium, and dark shades of blue and yellow. Click here to download a pdf pattern directly to your computer. 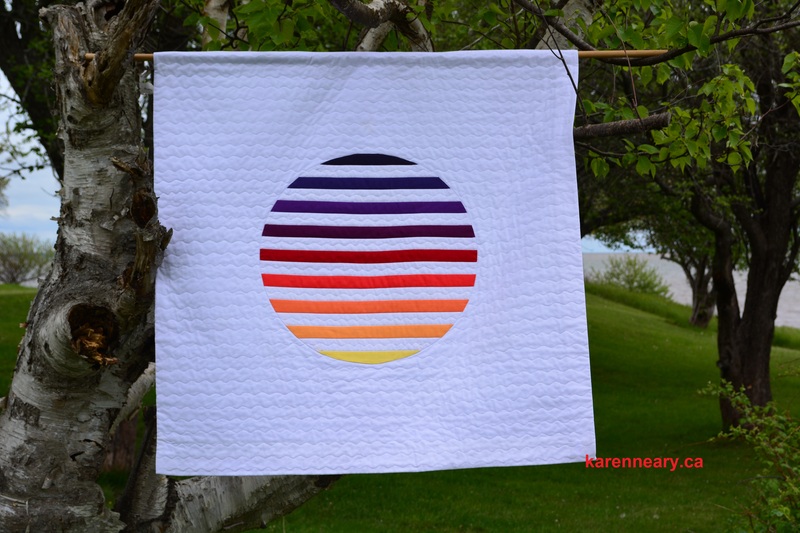 Welcome a new addition with this adorable quilt, easy enough for a beginner to stitch. You will love the ingeniously simple method used on the ring to give a tidy finished edge by machine. 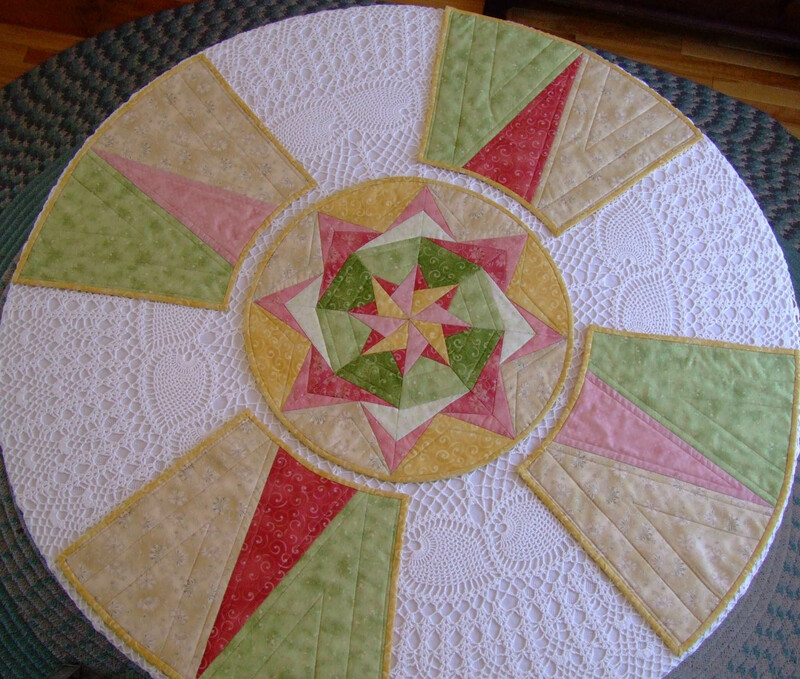 Sample shown has “Welcome Aboard” free motion quilted on the ring, but you can use the space to add baby’s name, and date. 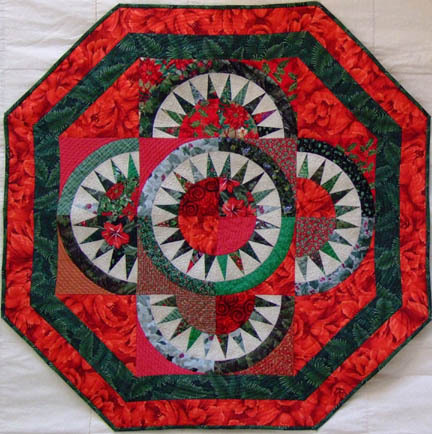 This one patch quilt, reminiscent of Grandmother’s Flower Garden, is made easy with rotary cutting and no Y seams. 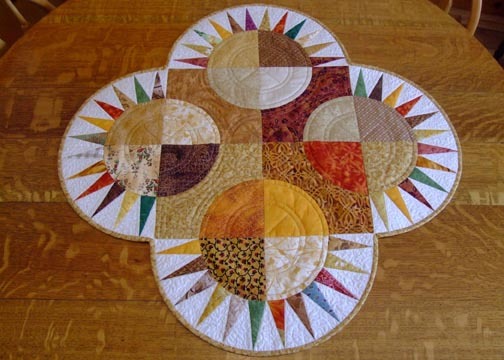 The half-hexagon template makes cutting and sewing a breeze. 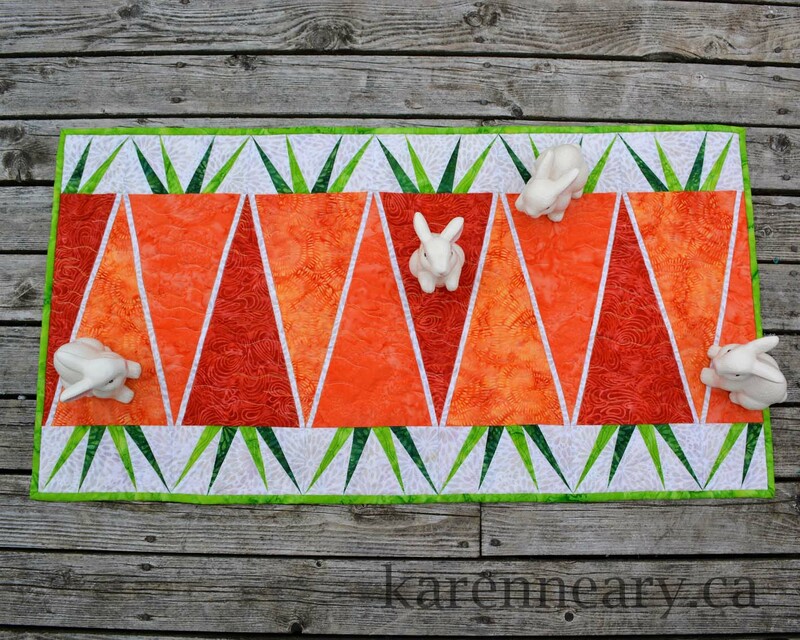 Zig-zag edges give an interesting finish to a beautiful quilt. Let Santa sprinkle some magic dust on his trip across the midnight sky, as you try out this technique for paperless paper-piecing (i.e., freezer paper piecing). The result is perfect points with no messy paper to remove afterwards. Magic indeed! Minimalist in both approach and construction, the sunset is contained within the sun itself. 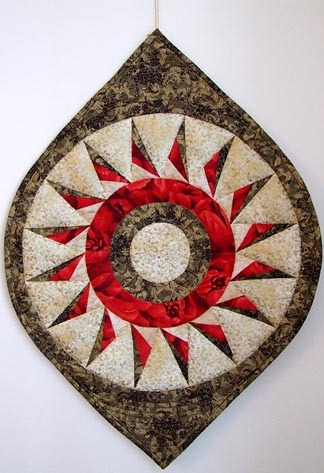 A project suitable for a beginner quilter, with simple to follow instructions. 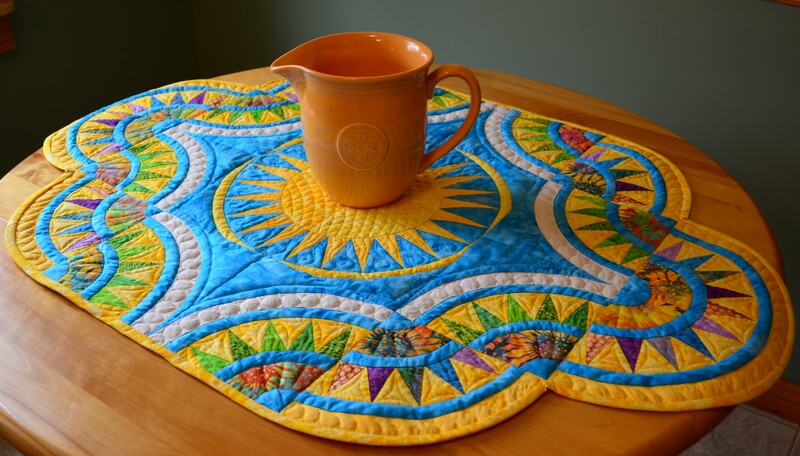 Bring a little morning sunshine inside with this unique and colourful quilted wall-hanging/table runner. Sample shown is pieced with Island Batik fabrics. Spikes are foundation pieced for accuracy. 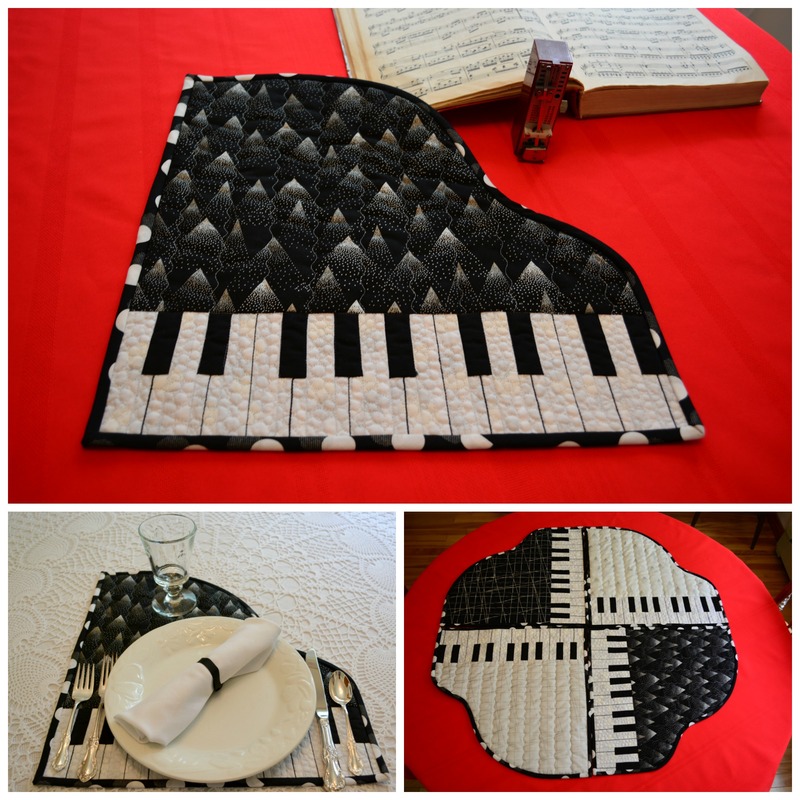 Pianists will love these table mats! The black and white grand pianos make such an elegant setting for a dinner table. Afterwards, they slide together to form an interesting 32" centrepiece for your table. This easy to sew set features a strip-pieced keyboard with details added with 12 weight thread (available for purchase here). Full sized pattern pieces. Click "add to cart" to purchase a printed pattern to be mailed to you, or click "download" to have the pattern instantly sent to your computer. Click here to download the pattern in pdf. Batik solids in cool blues and greens give a fresh, modern look to a traditional design. 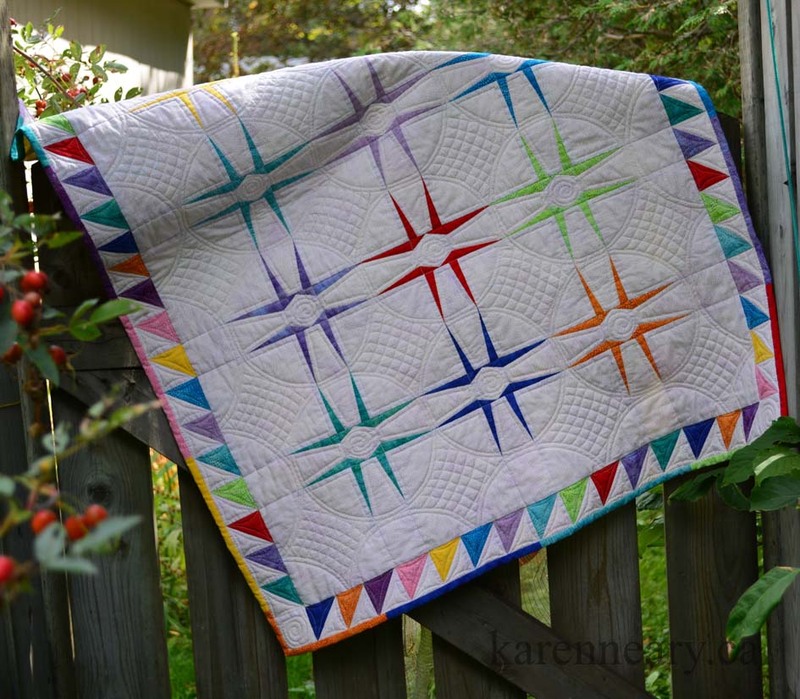 The argyle pattern is created in a super-simple way, by quilting with heavy weight thread (Aurifil 12 weight). Four individual hearts fit together to form a scalloped centrepiece for your table, or pull apart as individual placemats. New York Beauty blocks combine with easy Log Cabins for this unique and clever project. Piece it in greens for St. Patrick's Day! Spiked sections are foundation pieced for accuracy. Full sized patterns. This New York Beauty quilt captures the essence of the city for which it is named: blue/green water, blue sky, spikes of the Chrysler Building and Statue of Liberty, and a splash of yellow and black chequerboard to call to mind the iconic NY taxi cabs. 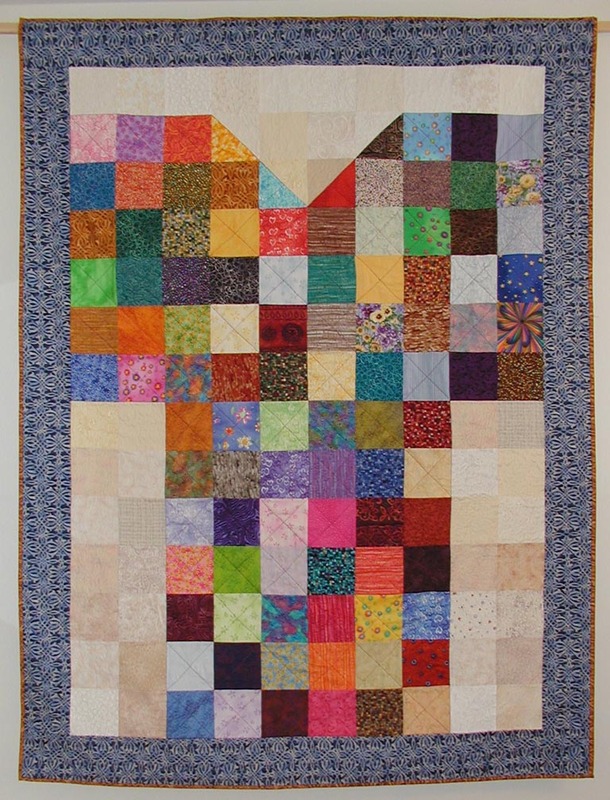 The quilt is vibrant and busy like the city itself. Full sized patterns are included. 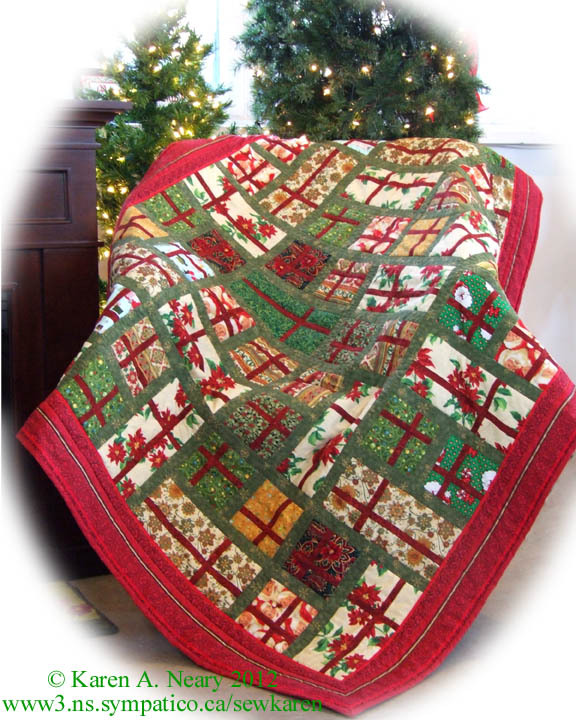 This sweet Christmas wall-hanging looks like hand-stitched embroidery, but it's really just free-motion quilting done using a heavy thread. The quilting and embroidery are added all in one step, making this a super quick project to complete. You will love it! Heads will turn when you arrive with this gorgeous bag! Pieced in a colourful array of hand-painted Bali watercolours, the soft sides on this bag expand to hold lots of gear. Bag features 3 inside pockets (1 is zippered). Runner: 12-1/2" x 33-1/4"; Placemat - 12-1/2" x 17-1/4"
This table runner and matching placemat are easily made with two simple blocks. The unusual outer shape adds flair to this appealing set. Pattern is also available as an instant download in pdf format. Runner: 22" x 36"; Coaster: 4-1/2" x 10-1/2"; Beach Blanket: 72" x 88"
Nothing says summer like a day at the beach sporting brightly coloured Flip-flops, surrounded by calming blue- green waves. 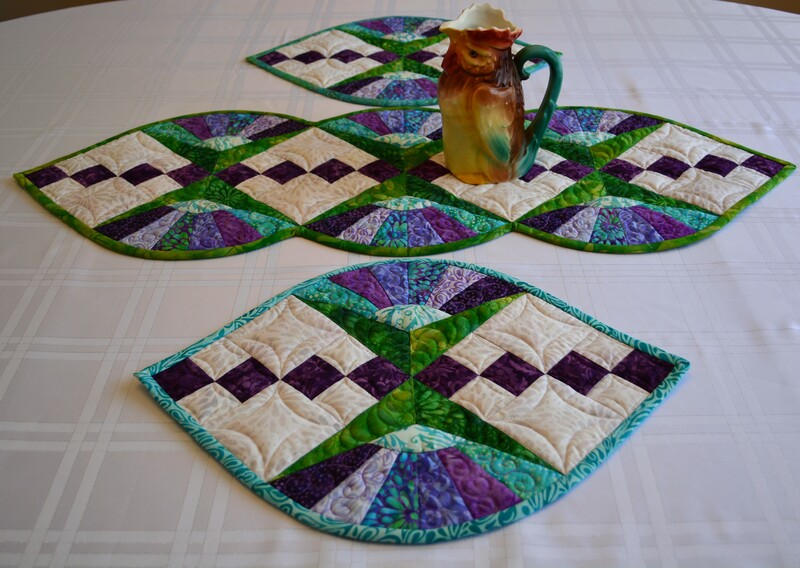 You will love this set, pieced with Hoffman Watercolour batiks and sporting simple-to-do wavy piecing in the border. 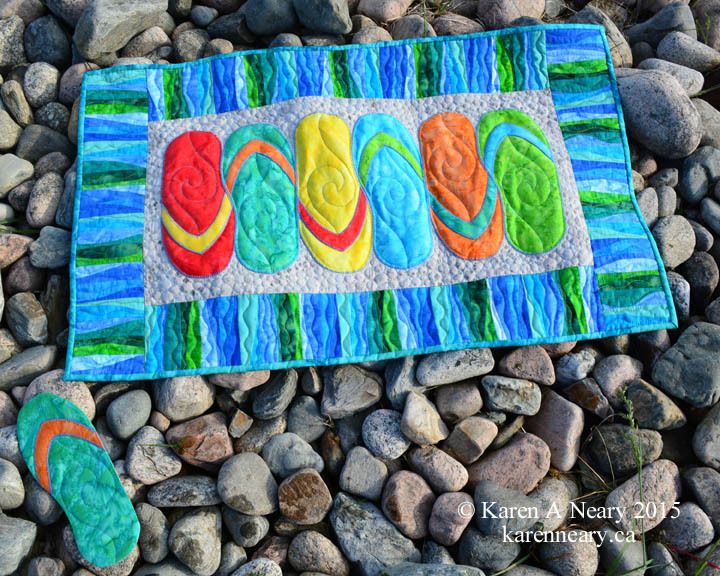 Pattern includes directions for runner, flip-flop coasters, and beach blanket. 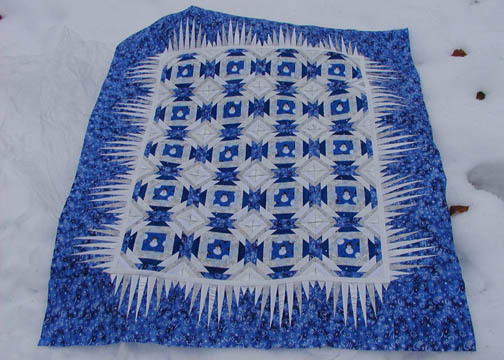 This beautiful quilt has been juried into Paducah, and then into the IQF "Hands All Around" exhibit, travelling across the U.S. Rhythmic looks as stunning on a table as it does on the wall. A bit of sewing experience is recommended for the curved seams. Full sized templates are included. 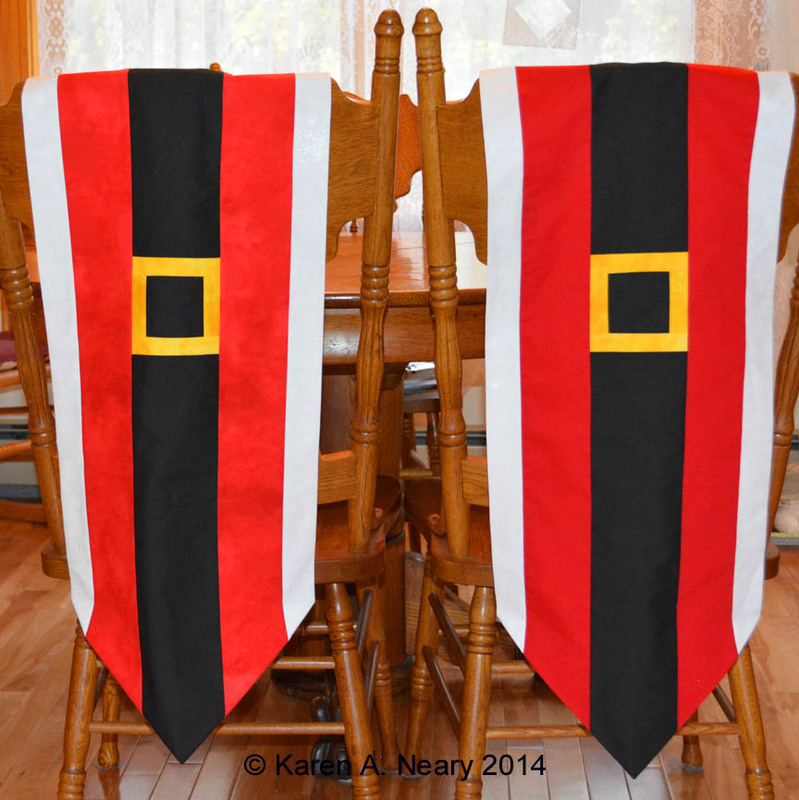 Pattern is also available as an instant download in pdf format for $8.00. Click here to download the pattern in pdf.. 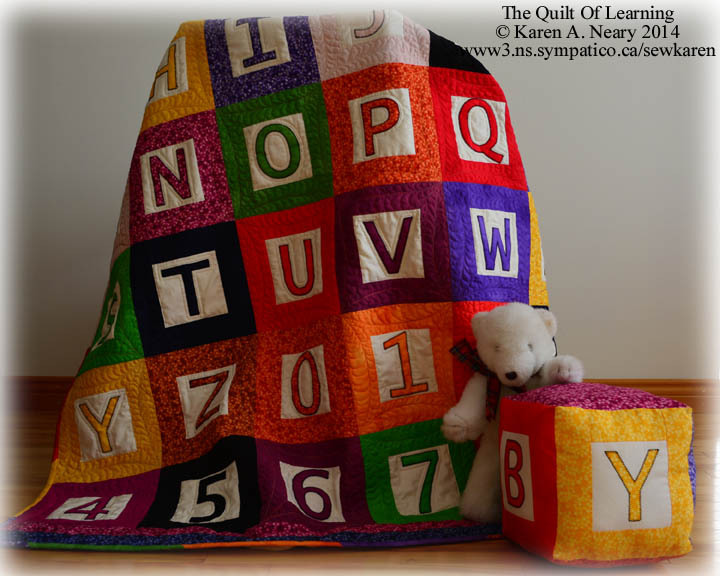 This simple to make child's quilt will teach your little ones the alphabet, numbers and colours. 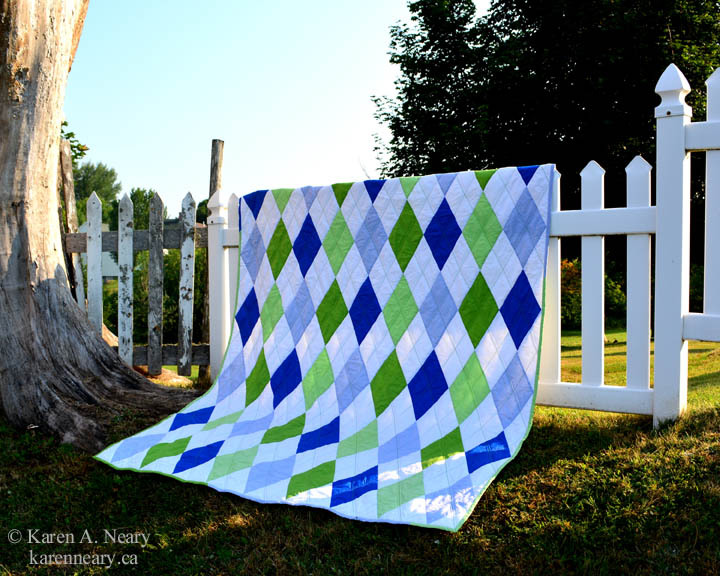 The extra-large size (54" x 62") allows the quilt to grow with the child beyond the crib. Pre-cut fabrics, fusible letters, and no seam matching between blocks makes sewing a breeze. Pattern includes full sized letters and numbers printed mirror image, ready for tracing. Directions for matching cube pillow included. 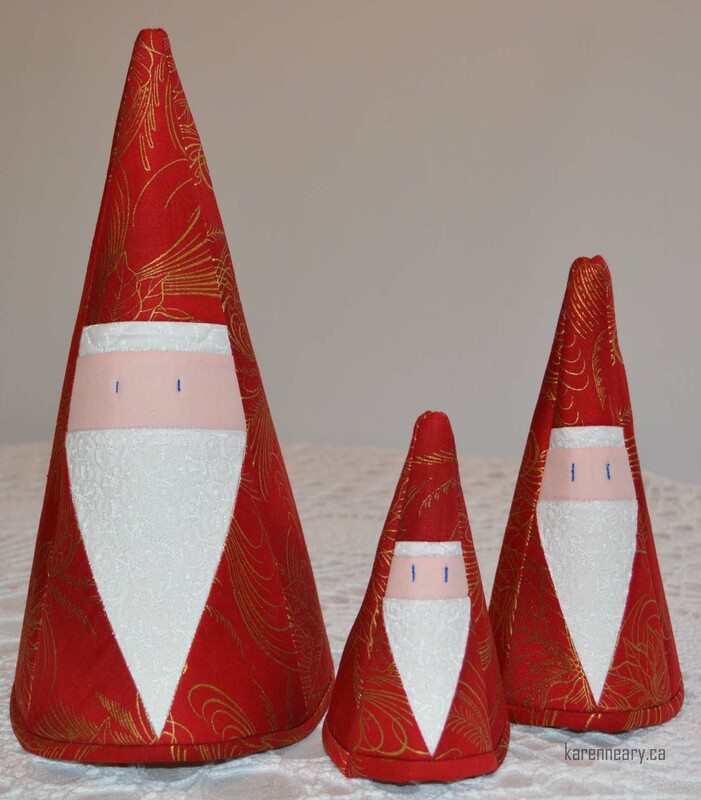 What a terrific way to use up leftover pieces of Christmas fabric. 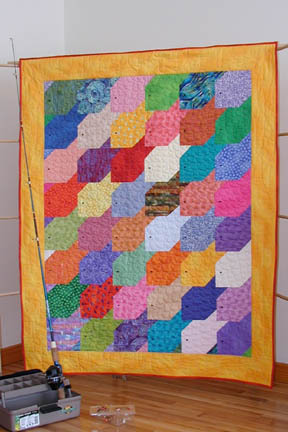 The blocks build quikly using strip-piecing methods. 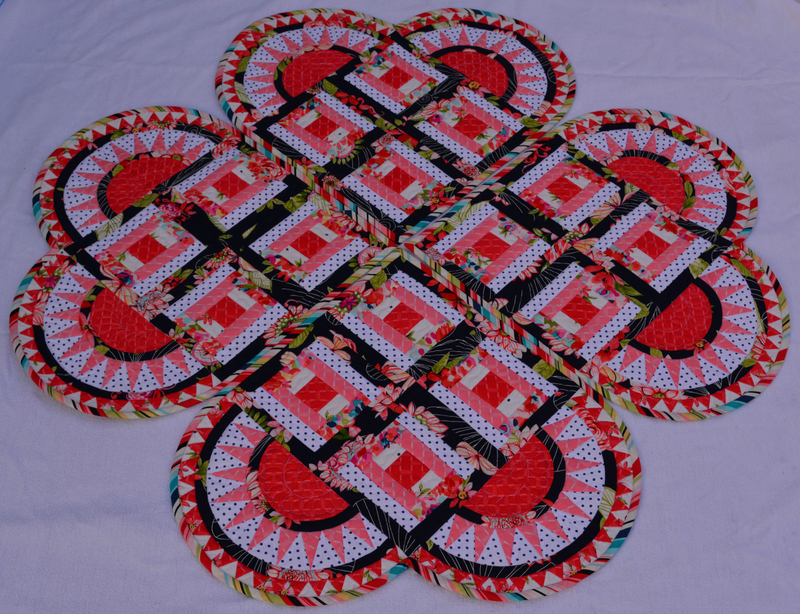 Pattern includes directions for making placemats, a table runner, and a lap quilt. 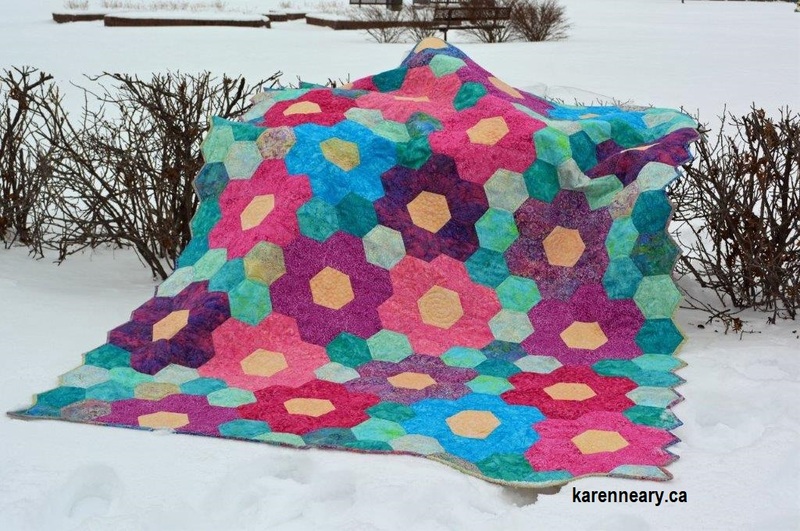 You can easily make the quilt full sized by adding more blocks. This is an easy beginner project. Large pieces and straight seams make for a quick finish of this dynamic design. No special ruler required. 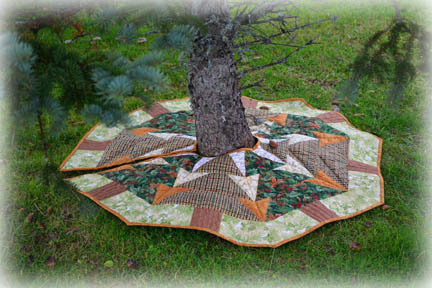 Directions include full sized templates and options for creating a tree skirt or table topper. 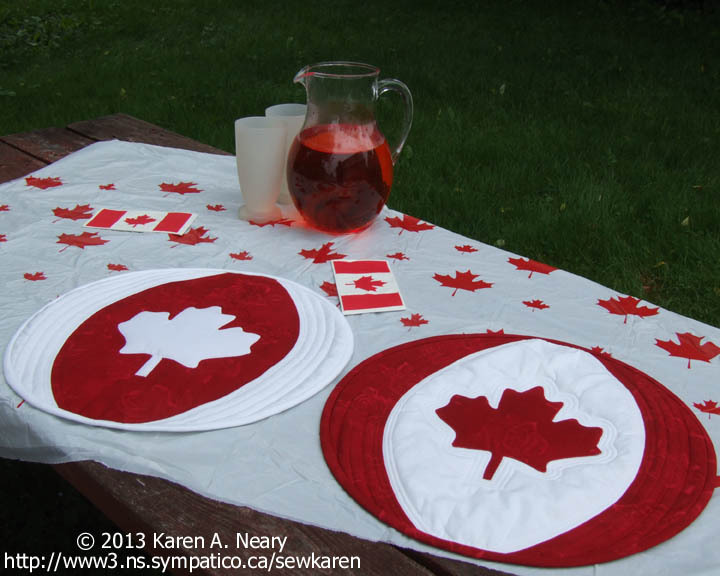 Perfect for Canada Day (or any day!) these beach ball mats dress up your table in a colourful and patriotic fashion. Simple to make with only two seams to sew. Maple leaf is machine appliqued. Includes full sized pattern pieces. This variation of a New York Beauty block makes an eye-catching centrepiece for your table or wall. Placemat pattern is included. A bit of sewing experience is recommended for the curved seams, but the results are spectacular! Spikes are foundation pieced. 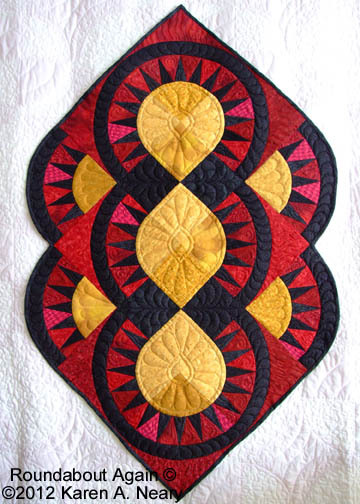 Create a dramatic centrepiece or wall-hanging using New York Beauty blocks. Spiked sections are foundation pieced for accuracy. Picture luscious berry shades of balis spinning in your blender to create this fabric fruit smoothie! Full sized templates included to make this stunning piece of wall art using one simple block. Click here to instantly download this pattern. Around The Table Placemat and Centrepiece Pattern #111 $12.95 Placemats:19"x 12-1/2" Centrepiece:18"
Dress up your round table with this stellar table set. The circular centrepiece is surrounded by wedge shaped placemats which fit the curve of your table. Set is shown on a 48" table. Full sized templates included for the placemats, as well as master foundations for paper piecing the centrepiece. 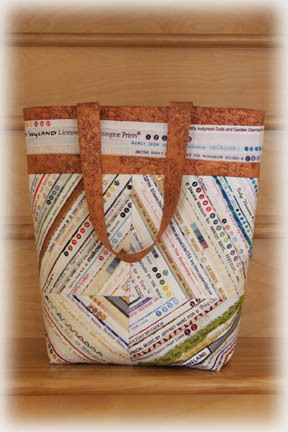 Selvedge Tote Bag Pattern # 110 $10.95 14"x14"x5"
Go green and reclaim those normally discarded selvedge edges to create this stylish tote as featured in McCall's Quilting. Matching electronic gadget bag for your cell phone, camera or iPod. Fully lined tote features an inside zippered pocket. Gadget Bag measures 3-1/2" x 6". Please click here to purchase this pattern as an instant download. This stunning design is based on a variation of a traditional New York Beauty block. The sharp curves are appliqued rather than pieced, thus avoiding sewing a curved seam. Spikes are foundation pieced. Yuletide Jewel Pattern # 109 $12.95 18" x 26"
This delightful wallhanging is reminiscent of old-fashioned glass ornaments. Requiring only 4 New York Beauty blocks to complete, this project stitches up quickly. Full sized foundation masters included. 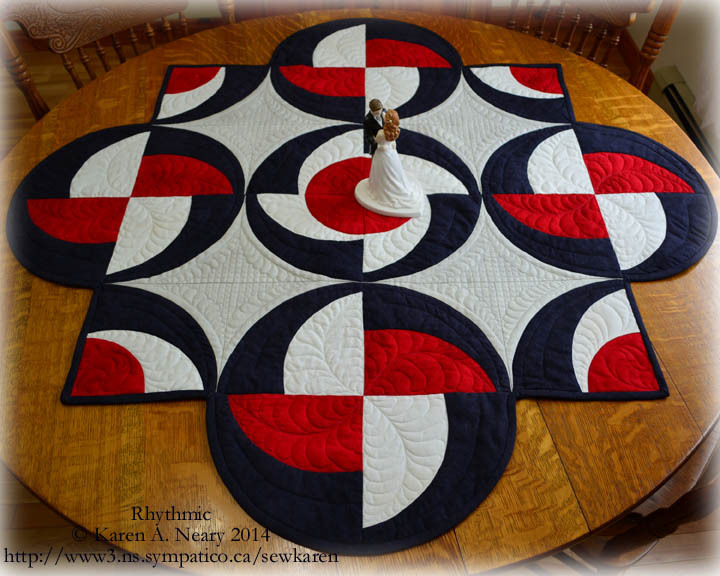 Six fabrics and two different blocks create this dramatic medley of colours. Blocks are a combination of traditional and foundation piecing. It's spectacular! Pattern includes master for foundation-pieced spikes. 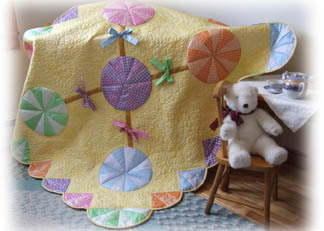 Sunshine & Lollipops Pattern # 309 $10.95 51"x 59"
One template is all that is required to make the lollipops and border fans in this delightful quilt. The lollipops are appliqued to the background making the project super quick to stitch. 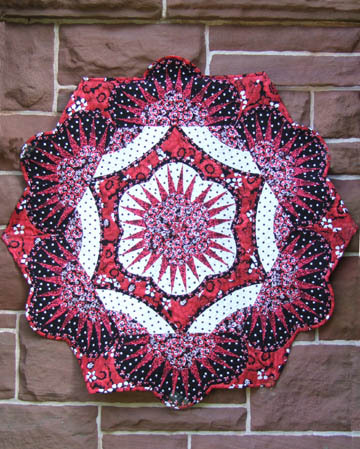 This elegant quilt makes a lovely wallhanging or centrepiece for your table. It is stitched using freezer paper applique thus eliminating the sewing of a curved seam. Full sized patterns included. 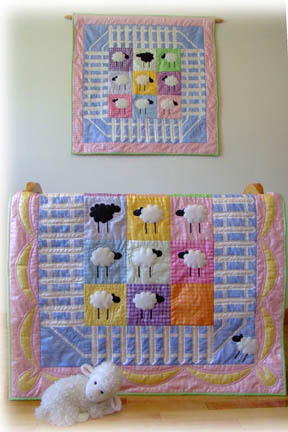 Quilt 38" x 44" Wallhanging 35" x 35"
This delightful nursery set of quilt and wallhanging is named for an old English sheep-counting rhyme which echoes the parable of the lost sheep. 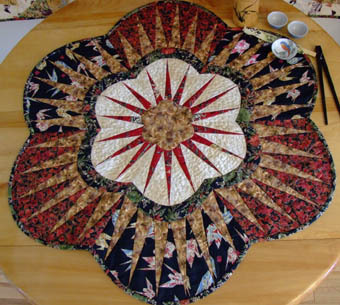 Project uses machine applique, strip-piecing and foundation-piecing methods. Pattern is also available as an instant download in pdf format for $8.00. Click here to download. 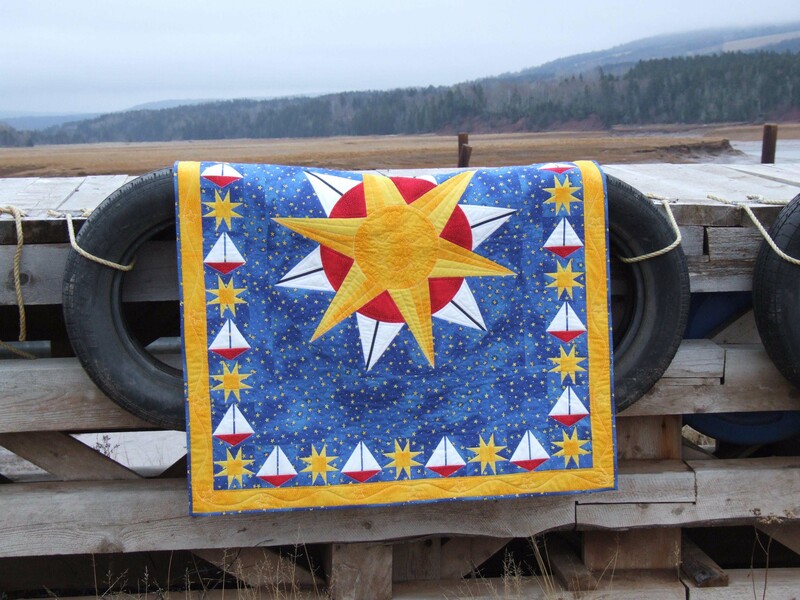 Encompassing Pattern # 106 $9.95 56" x 68"
An original variation of a Mariner's Compass block coloured four different ways forms a secondary design of stars in this nautical lap-sized quilt. Foundation piecing makes the compass block easy to master. Pattern includes full sized foundation masters as well as a step-by-step primer on foundation piecing. 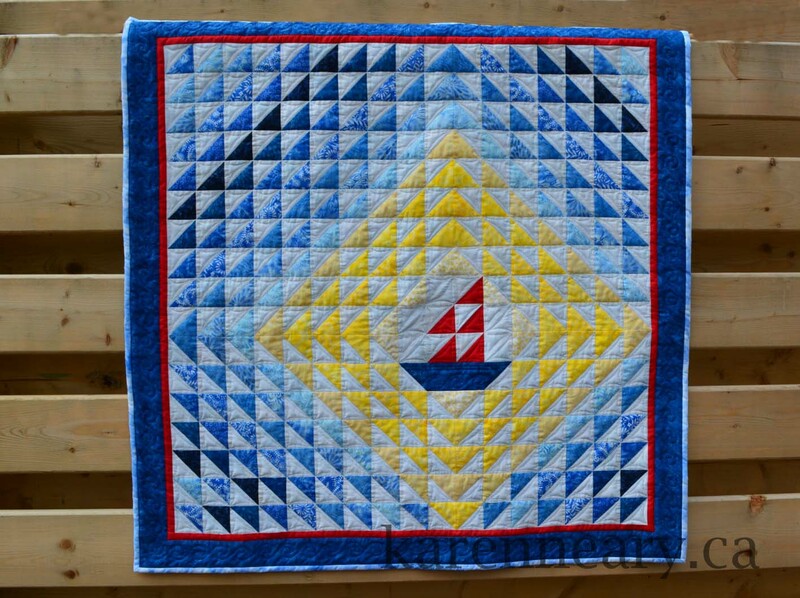 Ships Compass Crib Quilt Pattern # 103 $9.95 40" x 48"
A Southern Star compass block, pieced using templates, is the basis for the centre of this nautical crib quilt. 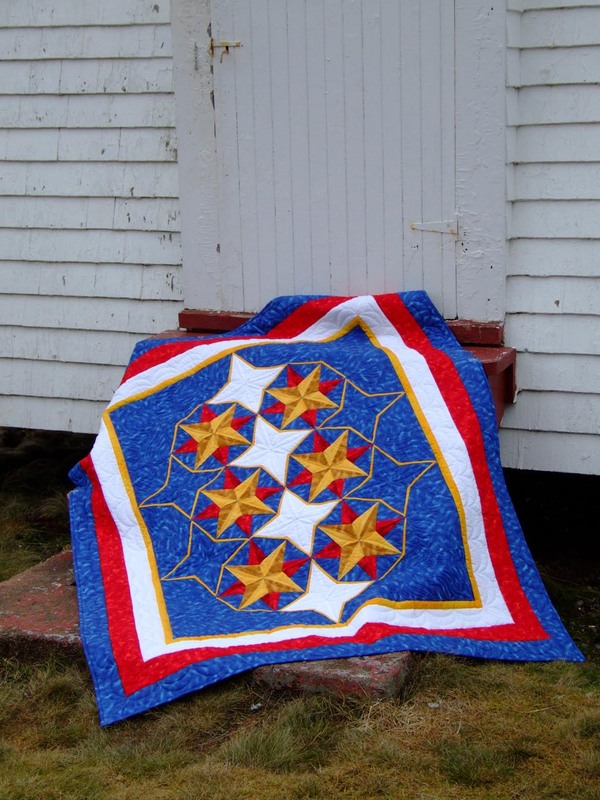 Border sailboats and stars are foundation pieced. Pattern includes full sized templates and foundations. Starry Night Pattern # 503 $12.95 43" x 53"
Sail a fleet of boats under a twinkling midnight sky. Foundation piecing makes these sailboats and Mariner's Compass stars east to navigate. 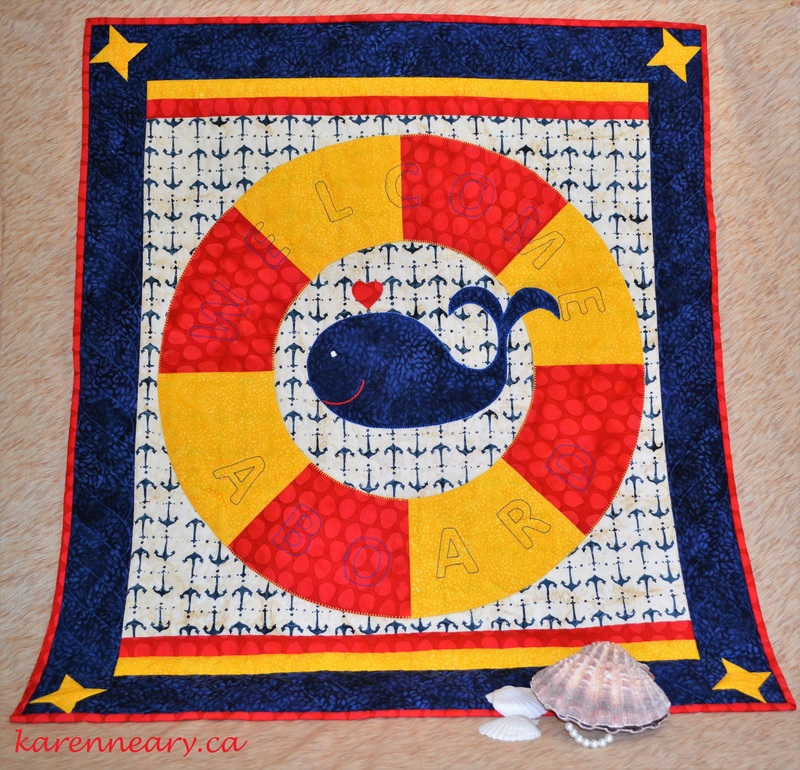 Charm School Quilt Pattern # 603 $9.95 44" x 56"
Coat of Many Colours Pattern # 205 $9.95 48" x 64"
A perfect pattern for using up 5" Charm Squares or scraps while telling a favourite Bible story. A very simple template free design using only squares and half-square triangles. Frost Bite Pattern # 707 $10.95 37" x 43"
This foundation pieced beauty makes you shiver just looking at it! Full sized foundation masters are included for both the pineapple and icicle blocks. Some sewing experience recommended for this one. 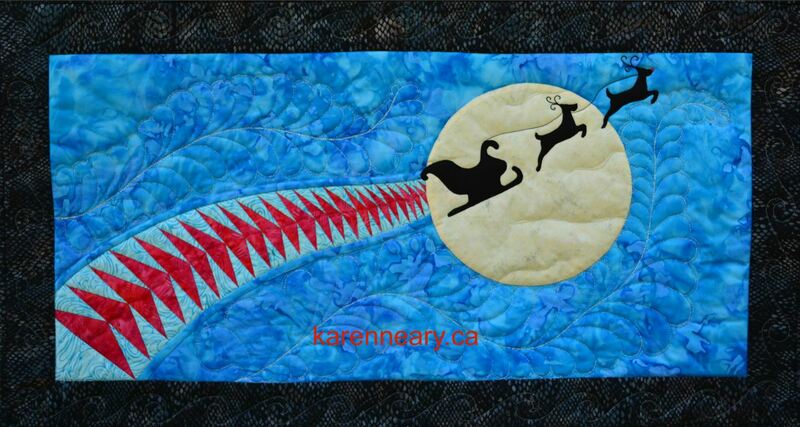 Silhouette applique highlights a traditional "Trip around The World" setting as Santa and his reindeer embark on their annual midnight voyage. 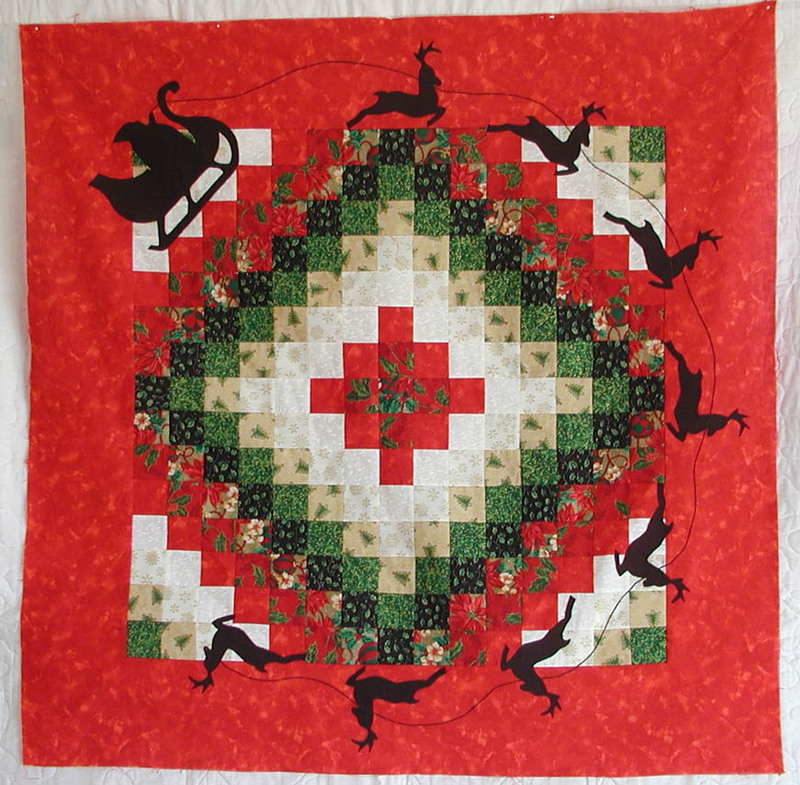 Background is strip-pieced; full sized patterns are included for Santa and the reindeer. 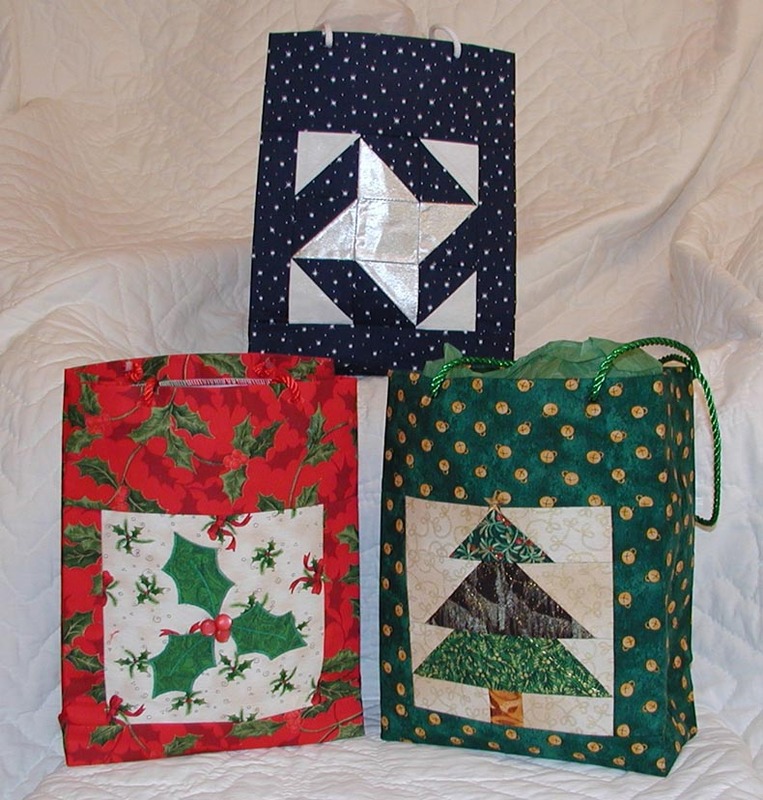 Christmas Gift Bags Pattern # 605 $10.95 8" x 10"
What a great way to share your quilting talent. The gift is the bag! Directions included for all three bags shown. Two are foundation pieced, one is appliqued. Click here to download the pattern instantly. 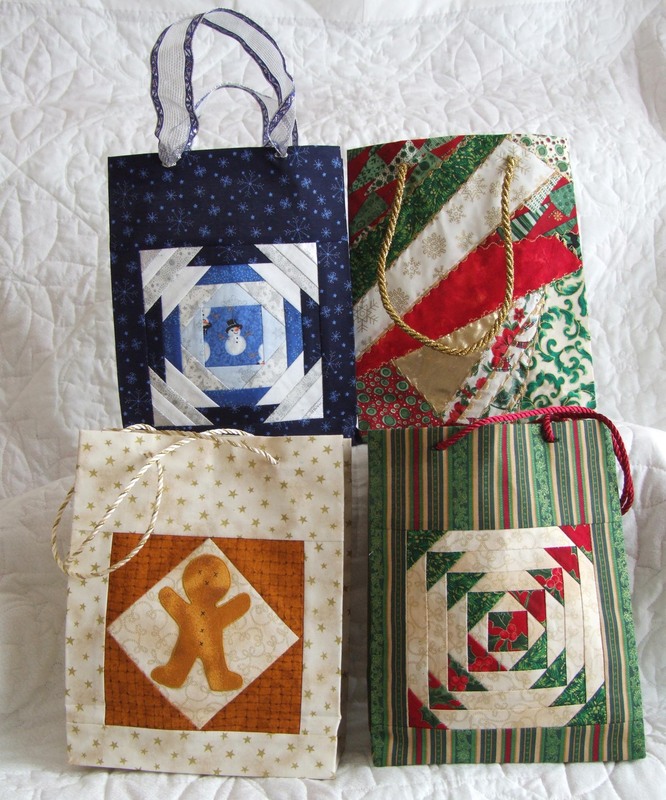 It's In The Bag Pattern # 606 $10.95 8" x 10"
Because of the popularity of the Christmas Gift Bags we've added more designs! 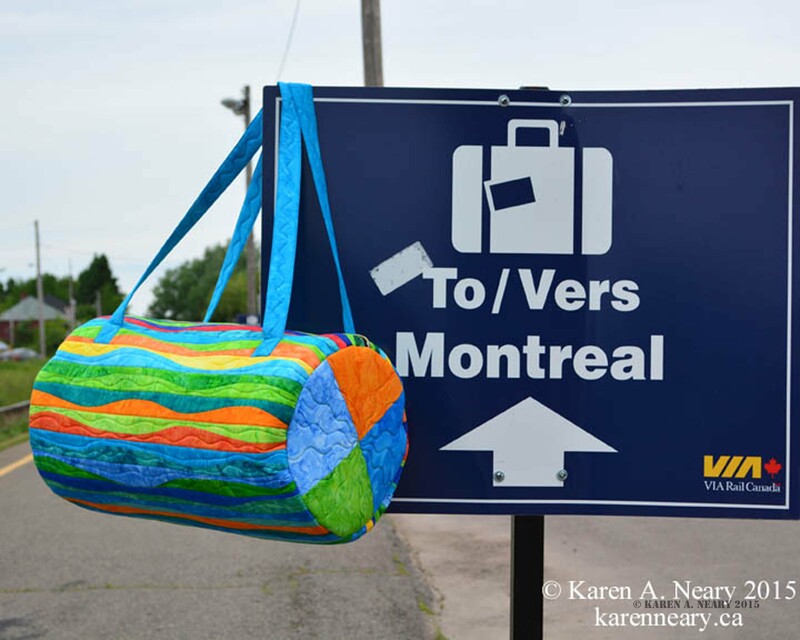 Directions for 4 bags are included: two are foundation pieced, one is appliqued and one is crazy-patch.